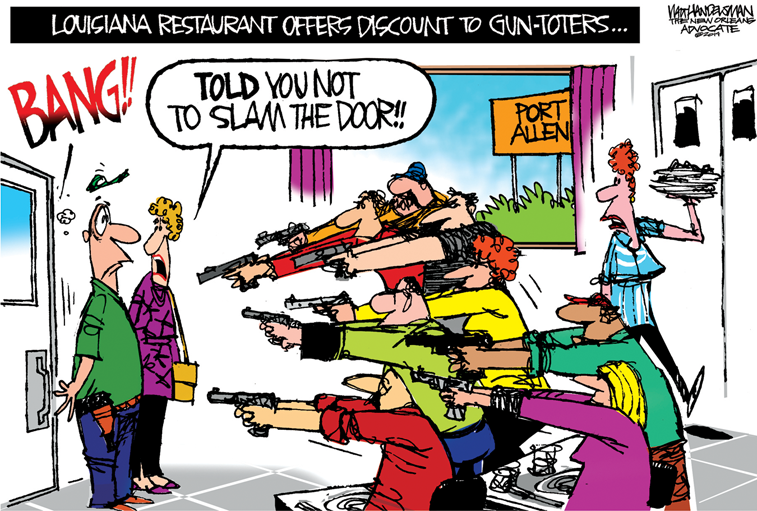 I’ve been in a restaurant that offers a discount to “gun-toters” multiple times and have never seen anything like this happen. I also been in restaurants hundreds of times while I and/or others were carrying and not once have I seen anything like this happen. 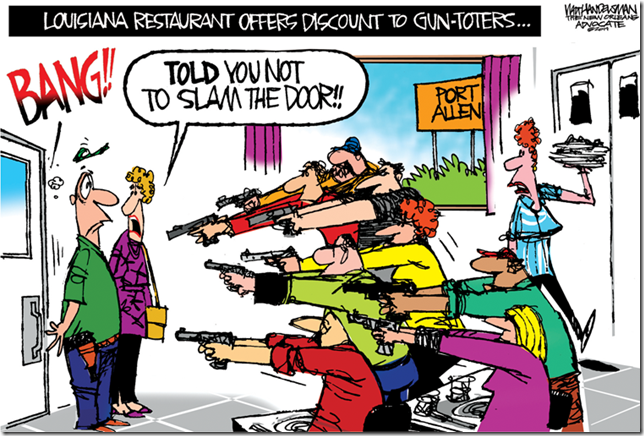 The cartoonist has an extremely wild and error prone imagination and/or is prejudiced against gun owners. What would be the response if some cartoonist hypothesized some equally outrageous consequences for a restaurant that welcomed people of color or alternate sexual orientation? Bigotry and prejudice is never pretty regardless of the target. People should explain this to the cartoonist and the media that propagate this sort of thing. I recall an interview not long ago in which a gun hater pointed out that if someone handed her a gun she’d probably look for someone to shoot with it. So I guess what we have in this cartoon is the same thing, which I believe psychiatrists call “projection”. I think I remember that one. They’ve all got a good, two handed grip, isosceles stance, leaning forward slightly, and nobody’s accidentally muzzling the back of anyone else’s head (apart from the two folks at the door. At least good shooting form is has become commonplace enough that even anti-gun douchenozzles are illustrating it.